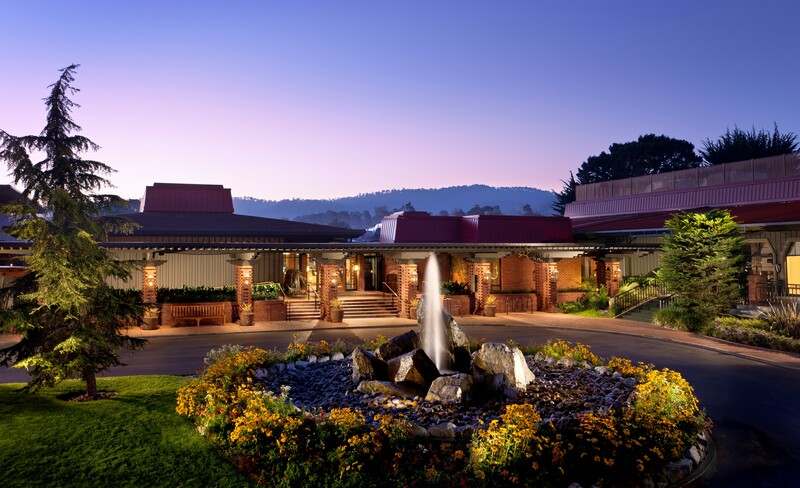 Located literally minutes from the Monterey Airport and tucked away in a beautiful secluded area of one of America's most desirable vacation destinations is the picturesque Hyatt Regency Monterey Hotel & Spa, a property surrounded by the Del Monte golf course proving to be an ideal venue for corporate retreats or family escapes. Their impressive conference center is also a popular venue where corporate groups hold meetings throughout their stay on the property. The Hyatt is a place where families are welcome and can experience a multitude of fun facilities within the natural surroundings of the property as a group or individually. During my visit I enjoyed watching a junior golf tournament in process and the amazing young golfers on the course playing for awards, some as young as six years old. Del Monte Golf Course offers bag storage and a golf pro shop to guests Additional fun resort games including ping pong, chess, oversized checkers, and family board games are also available for family enjoyment. Dining venues at the hotel include the Fireplace Lounge where lunch and dinner, either inside by the fireplace or out on the terrace overlooking Del Monte golf course is so comfortable with a staff that are friendly and accommodating. This is also a favorite place on Friday and Saturday night to savor small plates while listening to great jazz. The hotel brings some of Monterey's best jazz musicians to entertain their guests. I thoroughly enjoyed listening to the Jazz Trio of drummer Dr. David Morwood, base player Joe Dolister and renowned guest guitarist Bob Basa during my visit. Food & beverage is an ongoing experience here and the TusCA Ristorante has a menu inspired by Tuscan regional dishes created by Executive Chef Steve Johnson and Chef Logan Sandoval who boast the use of all locally sourced seasonal produce, meats and fish. The Niman Ranch lamb chop and scallop dinner with parsnip puree the Chefs' prepared was so outstanding, and was perfectly paired with Twisted Roots Cabernet. Additional menu items include exciting appetizers, salads with beautiful anti-pasta plates. By day this is a relaxed and sunny dining room filled with guests for breakfast where a wonderful buffet is featured daily or guests may select items like toast and tea or eggs Benedict from their full menu. The lunch is busy and offers everything from healthy salads to your favorite hamburger. At night it becomes a shimmering dining destination where guests savor entrees that include seafood favorites, exceptional pasta specialties and outstanding meat dishes. The hotel also offers a well rounded wine list featuring local and imported wines for pairing with dinner, and wonderful signature cocktails at the bar or fireplace lounge. For guests who want to just relax in their room after a day of golf or sight seeing they offer a full room service menu. There is also a small Hyatt Market that always seems busy and offers fast food items of pastries, breakfast sandwiches, hot coffee and beverages as well as snacks throughout the day for people on the go. Knuckles Sports Bar is a favorite family venue and has ongoing games of all sporting events on televisions throughout the large room. They have a full bar and offer snacks and a dinner menu. The Marilyn Monroe Spa, located between building 15 and the Garden Terrace Pool and Hot tub offers a full menu of massages, facials and body treatments as well as a full service salon to enjoy after a day of tennis, golf, swimming or shopping. A few steps from the spa you will find the StayFit at the Hyatt, an area devoted to keeping fit with countless machines, workout equipment, free weights and chilled towels that is opens twenty-four hours. Two heated pools and hot tubs are nearby for ongoing exercise or relaxation. They have a Racquet Club for tennis lovers with complimentary court time, where guests can also rent bicycles to ride around the property during their stay. If you like to take your puppy along you will be happy to know that pets are welcome at the Hyatt, and guest are encouraged to walk their pets throughout the hotel grounds, with the exception of the of the restaurants, and pets must be leashed at all times on the property. I noticed guests seemed to be enjoying walking with their pets through the beautiful tree filled grounds. Fun things to do in the surrounding area include a ten minute ride by car or a $12 taxi ride to the Monterey Aquarium, shopping on Cannery Row or enjoying a cocktail at one of the renowned restaurants overlooking the ocean. The Aquarium turns all of us into children for a morning or afternoon and is considered to be one of the best in the country. For many years now Monterey Aquarium has been a major supporter of the Seafood Watch Program. They have a restaurant filled with kids favorite foods and some delicious seafood items for the big kids. Out the door on Cannery Row you will find an amazing collection of fun shops to peruse and some historic seafood venues like The Fish Hopper to enjoy great sips and bites while shedding your stress watching the waves break below. From funky souvenir shops to fine jewelers like Z Folio you will find treasures to take home as a remembrance of your trip. There are also several wine tasting rooms and an amusing little wax museum to visit. For a sophisticated romantic venue try the C Bar & Restaurant in The Clement InterContinental Hotel or if you are looking for a wild place to dance with great music go early and get a seat at Sly Mc Fly's; the Legendary Chicano All Stars were performing while I was visiting and the place was jumping. Hyatt parking is self park or valet and is included with no charge and your car will be parked in front of the building where your room or suite is located until you leave: ADA parking is also available. Express check-in and check-out at the Hyatt makes everything so easy and can be done on the web or from your phone. For additional information visit: www.hyattregencymonterey.com. The Grill, located in the historic Williams Building, originally debuted as a pop-up in 2016 and, after receiving wide praise, has since become a permanent fixture, presenting an approachable bespoke menu with re-imagined classics and a minimalistic approach to preparation. Menu items incorporate locally-sourced, seasonal ingredients and honey from the hotel’s proprietary beehives. The Grill provides the ideal setting for a special occasion or a casual meal with a refined touch. Open daily for breakfast, lunch, dinner and weekend brunch, the Grill offers exquisite contemporary dishes presented a la carte or through the carefully curated tasting menus. Paired with the St. Regis’s signature highly attentive service, the Grill is a true culinary oasis from the hustle and bustle of the city. Previously, Boyland served as executive sous chef at San Francisco’s Michelin-starred Michael Mina restaurant where he spearheaded menu development and managed the kitchen staff. From 2014 to 2016, he held the role of chef de cuisine at AQ, perfecting the seasonal influence of the restaurant’s frequently rotating prix-fixe menus. Prior to AQ, Boyland was a member of chef Corey Lee’s three Michelin-starred Benu as chef de partie specializing in fish preparations. It was at Benu where Boyland developed the foundation of his kitchen philosophy. Additionally, Boyland was chef de partie at RN74 where he mastered various techniques of preparing and cooking meats. Under the tutelage of chef Jason Berthold, Boyland learned certain kitchen organizational skills and a level of culinary professionalism he has carried with him throughout his career. 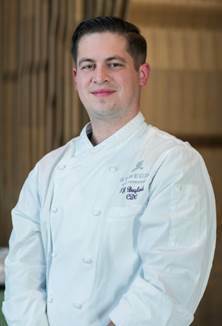 Boyland began his culinary profession in early 2009 working under chef David Varley at Michael Mina’s acclaimed Bourbon Steak D.C. at the Four Seasons Hotel in Washington, D.C. There, Boyland gained experience at various stations in the kitchen including prep, butchering, and pastry, which served as an invaluable foundation for his bright culinary journey ahead. The Grill is open seven days a week with breakfast service offered Monday through Friday until 10:30 a.m., and on Sunday until 11:00 a.m. Lunch service is offered Monday through Friday 11:30 a.m. to 2:00 p.m., and dinner is offered Sunday through Thursday from 5:30-9:30 p.m. and on Fridays and Saturdays from 5:30-10:00 p.m. On Sunday a brunch menu is offered until 2 p.m. Reservations are recommended and can be made at 415.284.4188. For more information, please visit www.stregissanfrancisco.com. The St. Regis San Francisco opened in November 2005, introducing a new dimension of luxury and timeless elegance to the city of San Francisco. The 40-story landmark building, designed by Skidmore, Owings & Merrill, includes 100 private residences rising 19 levels above the 260-room St. Regis Hotel. From legendary butler service, “anticipatory” guest care and impeccable staff training to the signature Remède Spa, luxurious amenities and interior design by Yabu Pushelberg of Toronto, The St. Regis San Francisco delivers an unmatched guest experience. The St. Regis San Francisco is located at 125 Third Street. Telephone: 415.284.4000. Website: www.stregissanfrancisco.com.